Only the juggernaut that is Pizza Hut would have the balls to spend millions of dollars on post-Super Bowl advertising to introduce the world to its version of the tiny pizzas they sell in the Wal-Mart freezer section for a dollar apiece. They aren't bad, but your time to really enjoy them is quickly running out. The Pizza Hut Big Pizza Sliders are the even-more-personal version of the Personal Pan Pizza. At only 3.5 inches across at its widest point (don't want to confuse the foodies by bringing geometry into this), each Big Pizza Slider in a convenient handful of pan-style pizza that will fit into the empty disk drive bay of an older computer. Pizza Hut sells them in batches of three ($5.00) or nine ($10.00), so you might want to hit up a used PC store before ordering. Portability is one of the greatest strengths of the Big Pizza Slider. Another is variety. 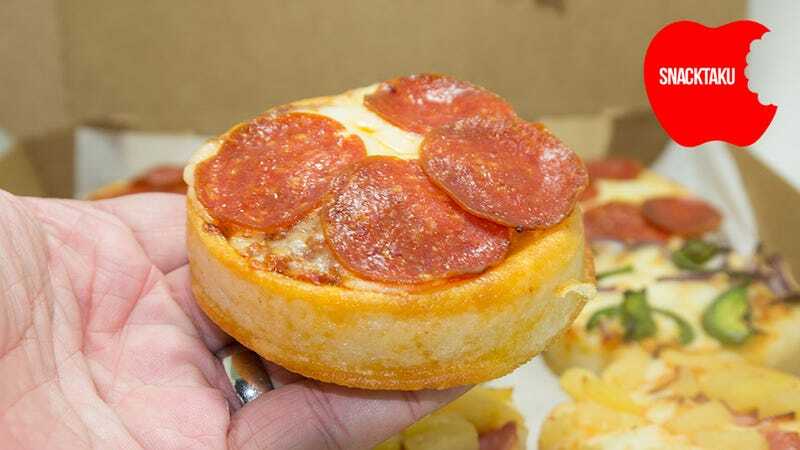 Each Pizza Hut technician has received clearance to decorate these mini-pizzas in groups of three, so a box of nine means you can order three different sets of toppings—that's pizza squared, only they are round and I promised I wouldn't bring math into this. For the purposes of this review I ordered a box of nine Big Pizza Sliders with three different topping combinations. First I went traditional with straight-up pepperoni. Its compact size and thick crust gave me Pizzabon flashbacks. For the vegetarian inside me (I ate one), we have green pepper and red onion. Note the tiny shards of vegetables that wound up on these. Pizza Hut finally found a way to use the remainders at the bottom of the veggie bin. Good for them! For the last variety I decided to go mildly exotic. Good old pineapple and ham. I mean good exotic pineapple and ham. Until I've been to Hawaii it still counts. It bears noting that the Pizza Hunt technicians have yet to figure out how to limit the pineapple on these tiny pizzas. I swear there was more fruit on those three little bastards than on any one regular-sized Pizza Hut pie I've ordered. Not that I order from Pizza Hut all that much. Of the big three—Domino's, Papa John's and Pizza Hut—the least possessive is the one I normally pass on (though lately I've been frequenting Jet's Pizza, home of the best BLT pizza anywhere), mainly because my wife worked there for a couple of years and whenever I suggest ordering from them her eyes glaze over and she just stares off into space for hours. The secondary I avoid Pizza Hut is the same reason you'd best order these guys quick—oil. Order a Pan Pizza from any well-established Pizza Hut and take a big bite of the crust. It's so juicy it could almost be considered a fruit. That's the oil from the bottom of the pans the pies are cooked in. At first there's a light coating, and the pizzas that emerge from them are light-ish and almost delicate. Over time that oil coating builds and builds, until each pizza produced is dripping with the stuff. Since the Big Pizza Sliders are a new product, all of the pans are new as well. The first batch I ordered, back when they first went on sale at the beginning of the month, were perfect puffy pieces of portable pie. They were delight to eat, warm and thick (but not too thick). The toppings are balanced nicely to the small size, and the thin edge meant I was never biting only bread. Now I'm sure that not every Pizza Hut store lets its pans get as sloshy as the ones my wife used to describe before I banned her from ever talking about her previous employment again. Maybe there's a Pizza Hut manager out there that sees oil pouring—not dripping—from his or her equipment and isn't too tired and worn-down to give a damn. That store and that store manager do not live near me. So if you're keen to try the Pizza Hut Big Pizza Sliders, by all means go for it. Just do it fast, before the "Sliders" in the name takes on a whole-new, disturbingly biological meaning.